Shortly after its formation the Manly Bicycle Club took part, on their pennyfarthing bicycles, in the Suburban Bicycle Club Intercolonial meeting of 9 May 1885 held at the Association Cricket Ground. Manly Bicycle Club was a forerunner to MWCC until the beginning of WWI in 1914. It should be noted that two of the greatest participants and supporters of the Manly Bicycle Club over many years were Manly Mayors, Ellison Wentworth Quirk and Frederick Charles Passau. Unfortunately because of the Great War most of the bicycle clubs then in existence were disbanded for its duration. The existence of Manly Bicycle Club from 1885 to 1914 is well documented in “Alive with Wheels” (see above), but its relationship to MWCC is yet to be determined. It remains unclear whether any bicycle club existed on the northern beaches between 1914 and 1957 when MWCC was formed. If anyone has information about local cycling during this period it would be greatly appreciated. 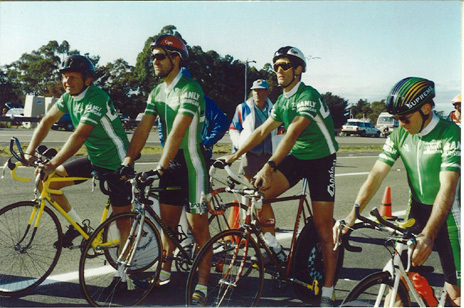 Three 17 year-old friends and riding companions from Narrabeen, Jeff Hoffmann, Phil Lambert, and Roger Aldenhoven, had the vision to form a cycling club for the northern beaches of Sydney on 3 October 1957. The attendance record for the first meeting of “Manly-Warringah Amateur Cyclists’ Club” shows that most of the founding members were also from Narrabeen, or the surrounding suburbs, and that Jeff Hoffmann’s family was well represented. * The first ever race was held on November 9th  on the Warriewood circuit …..
* Our first committee meeting took place on February 12th, 1958 …..
* … that same month [April 1958] the club colours first became available and cost £2..8s..6d. 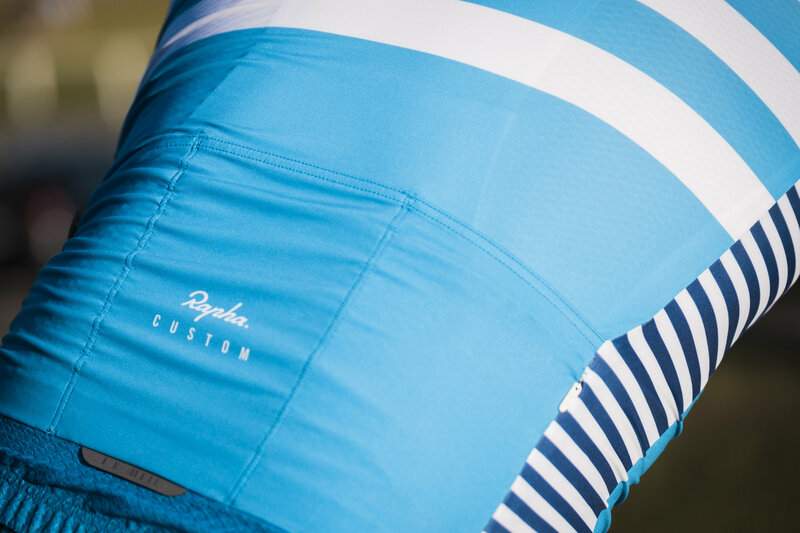 These colours were:- black jersey with three inch band of pale blue around chest and back with pale blue collar and cuffs. Later a white silhouette of a seagull in flight was added to the back, underneath the letters M.W.A.C.C. * On July 2nd 1958 Leo Fransen was first elected president and would subsequently prove to be our club’s longest serving president (15 years). Wendy McDonald took over as treasurer and gave the first written treasurer’s report …..
* … there was discussion about changing the club colours which eventually happened in January 1963 [to green and white] …..
* One of our present day life members Chris Kruf ….. had a meteoric rise to the top for he and Dave Humphreys [1964 Tokyo Olympian] both represented N.S.W. in the  Australian Cycling Championship. * Gary and Dorothy Teague joined the club in 1965 and within a year Gary [achieved] fastest time in the 1966Sydney to Goulburn. Later that year he became secretary …..
* In 1967 a perpetual trophy was proposed for the first time for the club champion and is still in use today …..
* A 25 mile (40km) perpetual Time Trial Championship Shield was also bought but unfortunately has since been lost. * The club fees for 1967 were $2 for seniors, $1.25 for juniors and 50c for juveniles. * In 1967 … the club began racing at the rear car park of Warringah Mall. Barely a kilometer in distance with six right angle corners, it made for some very exciting racing. * Our club celebrated it’s tenth birthday in October 1967. * 1967 was also the first time that a Sydney Metropolitan Road Cycling Championship was held ….. it was Frank Fransen’s idea for our club to promote the road equivalent [of the Track Championships] ….. on May 28th. * Police Commissioner Norman Allan agreed to become our patron to cap off a very successful tenth year. * In August  Gary Teague was selected in the N.S.W. Road Team to contest the Australian Championship in Hobart where he finished seventh. * Early in 1971 Chris Kruf took over as president and his sister Emmie became secretary. * 1972 saw Bart Kruf win the Sydney Metropolitan Road Championship at Warriewood in a thrilling sprint finish. * There were no recorded minutes for 1973 and much of 1974. * 1974 … Gary Teague won the Metropolitan Road Championship at Warriewood in a 20 km solo breakaway finishing 2 minutes, 30 seconds in front of the bunch. * Regular monthly club meetings ceased in November 1975 and did not commence again until 1986 …..
* In 1979 membership had fallen to nineteen with less than ten members racing regularly. * In 1983 Bernie [Freeman] gave up a whole season of racing, became president and helped the club through a very difficult period. * Gary and Sue Fairweather made their impact on the club in 1985/86 boosting membership to over one hundred and forty when we were the second largest club in N.S.W. Many of these new members were triathletes …..
* 1987-1990 could best be described as rebuilding ….. numbers fell so low that every member found himself on the committee! * 1991 will be remembered as the year … Tony Sattler … shatter[ed] the Brisbane to Sydney cycling record by three hours, twenty minutes. * [In 1992] we [had] a membership of over eighty ….. Sandra Bury … enjoyed her first serious mountain bike season ….. lying second in the Australian National Series. John Guy, who [in 1991] won a silver medal in the Australian Mountain Bike Championship … also [did] extremely well …..
Little documentation for this period has so far been obtained. Some is thought to have been lost during a dispute over leadership shortly after this time (see 1999). The following provides some information about the club’s endeavours and difficulties during this period. Any further information that club members or associates can provide would be greatly appreciated. “The Manly Warringah Cycling Club initially made application to the Abbott Road Land Management Committee to install a cycling track on the land. Unfortunately the area the Club required was greater than that available to the Management Committee. As Council is anxious to establish this type of recreational use somewhere in Warringah, an alternate suggestion was made to establish the track at the JJ Melbourne Hills Reserve. This site was inspected by Councillor Brook, Eugene Herbert and Graham Jones from the Manly Warringah Cycling Club. A special meeting was called of the stakeholders in the Management Committee for the reserve to discuss the proposal by the Manly Warringah Cycling Club. 1. That subject to Council approval the Committee agreed that the Manly Warringah Cycling Club proceed with their application for a grant. Disagreement within the club over how to further develop its recently constructed track, and how to meet its related financial commitments, divided both the committee and club membership. It also threatened to jeopardise its relationship with Warringah Council and other users of the JJ Melbourne Hills Reserve who were relying on the club to meet its previously agreed financial and track-management responsibilities. On 24 February 1999 Warringah Council convened a meeting of the affected parties. Minutes of the meeting outline the club’s immediate responsibilities to ensure conflict with other reserve users was minimised. The club’s financial situation and leadership are also raised as issues during the meeting. Unreconcilable differences of opinion regarding the JJ Melbourne Hills Reserve track split the club’s membership and committee and led the club into a lengthy period of decline. Both the BMX and Mountain Biking constituents left the club and the committee tried to address a leadership dispute which resulted in its own disbanding. Postscript: In 2004 the bus driver was convicted of negligent driving while Graham was shown to have been riding in a safe and legal manner. Public liability insurance concerns were making it difficult for all sporting organisations to continue their activities. The situation was no better for MWCC which was already suffering a decline in membership. 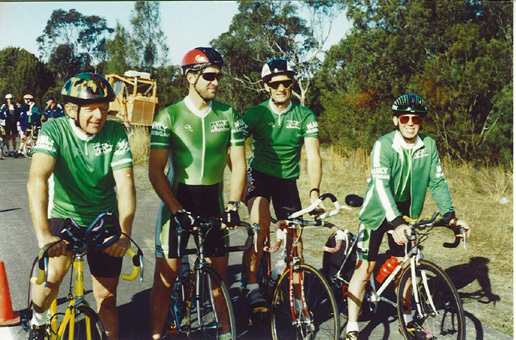 As reported in the Manly Daily July 5, 2003: “Public liability insurance has led the crown solicitor to tell the government to tell cycling clubs that they can’t race.” Peter McNamara president of Manly Warringah cycling club. Criterium races conducted at Brookvale around 1km (250m square) street circuit – Orchard Rd, Mitchell Rd, Wattle Rd, Ada Ave – until commercial development and traffic calming devices made it too dangerous to continue using as a race circuit. Time trials conducted at Terrey Hills from Tepco Rd out and back along Booralie Rd. Road Races conducted in Ku-ring-gai Chase National Park – from bottom toll booth out and back along West Head Rd (some races continuing through Akuna Bay and finishing at the top toll booth). Summer racing: mid-week evenings – St Ives Driver Training Centre. Winter racing: Sunday mornings – West Head / Akuna Bay. The last decade was difficult for MWCC after the tumultuous events of the late 1990s. Membership fell to less than 30 despite strong growth in cycling generally during the same period. Peter McNamara served as Secretary / President during this time and continued to organise races despite the dwindling numbers. Bernie Freeman once again stepped-in and lent a hand at a time of great need. There was a strong turnout at Barcino to the AGM last Sunday with 21 attendees and 5 new members joining the club on the evening. Peter McNamara was nominated to be a Life Member for MWCC. It was enthusiastically endorsed by all in attendance. Peter has been the lifeblood of the club over many years, and he continues to devote lots of time and energy into the club. Other appointments included Peter McNamara as Race Director, Peter Hopper as Social Ride Co-ordinator and Jim Buda as Club Handicapper. Plans to revitalise the club came to fruition in 2008 with: regular meetings; new logo, uniform, and sponsors; increasing membership (aiming for 100 by the end of the year); and greater communication with members leading to a significant increase in the number of competitors at club races. Thanks to the work of Mike Foster and particularly club Secretary Ross Mackenzie and his partner Angela Falzarano the club has become reinvigorated. The club secured increased sponsorship and with a greater presence on the road, the local riding and racing scene continued to grow. Membership numbers continue to grow due to the tireless work of Ross and co and when it came time for a change in leadership – the previous committee handed over a club in a good financial position and also a growing and active membership base. In 2011, the club saw a change in committee leadership due to work commitments of both Mike and Ross. Long time member Jim Buda became president of the club and this was also a time of a large amount of exposure for cycling due to Cadel Evans winning his first Tour De France title. As a result the club saw further growth in numbers at its races and its membership levels. The club grew to a size of 225 financial members and has continued with its monthly races at West Head which were held on the second Sunday of the month. These races have been attended by riders such as Rabobank Sprinter Mark Renshaw and the certain races have had over 150 riders in attendance. In 2012 the club in conjunction with Manly Warringah Mountain Biking Club, launched a cyclo cross series at JJ Melbourne Hills Reserve at Terrey Hills, this race series has been incorporated into the inaugural Cycling Australia Cyclo Cross Series in both 2012 and 2013. In 2013 the club in conjunction with MWMTB hosted the inaugural NSW State Cyclo Cross Championships, which were held during Bike Week and as part of the Manly Bike Festival the race was held at Manly Lagoon. With the riders racing through the park and parts of the lagoon in front of hundred of spectators. 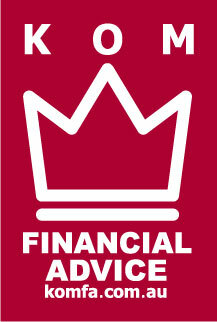 The club finished 2013 with just over 350 financial members. At the end of 2013 saw the return of criterium races to the HART Driver Training Centre at St Ives, with races held on Friday nights. The Club was the 2013 State Team Time Trial Champions. The club continued to grow strongly and by the end of the year would have just over 400 financial members within the road cycling group and 120 in the mountain biking section. The decision at this AGM was made that the club would not support riders wearing non MWCC kit at races and would not support private race teams and riders unless they were racing at a National level. This was to ensure continued equity within the club, to grow club culture and to protect valuable sponsorships with firms such as Subaru. The club has also focused on increasing participation for female riders and there is a popular Wednesday ride and also a social ride series introduced thanks to sponsor Allpress Coffee. The club also hosted female only race grades as part of the sydney Womens Race Series. During the year, the club hosted the first open handicap at West Head known as ‘The Wall’. This involved 5 laps of West Head before finishing at the peak of the Wall on West Head Road. This involved 200 riders and was won by Rob Redpath of SUVelo, with Jake Kauffmann of MWCC the fastest rider on the course. The club also hosted the U/17 NSW STate Mens and Womens Road and TT Championships, along with regular Road Racing events at West Head and over summer on Friday nights there was crit racing at HART Driver Training Centre, Mona Vale Road, St Ives. The club over winter hosted the Subaru Cyclocross at Terrey Hills. The Club Champion for the year was Andrew Pickering, the Masters Champion Phil Gray, Womens Champion Lynne Clarke, Junior Champion Alistair Hirsch. At the end of the year the club had just over 400 financial road riding members. The club has continued to improve its regular racing circuit, with the introduction of traffic controlled races along West Head road, which sell out every month. The cyclocross series was sponsored by Cell Bikes, 4 Pines Brewery and Kask Helmets for the first time. As per all previous years since the foundation of our series the club hosted a round of the State Championships for Cyclocross with Garry Millburn winning the MWCC round. MWCC became a sponsor of National Road Racing Team – Mobius Future Racing. 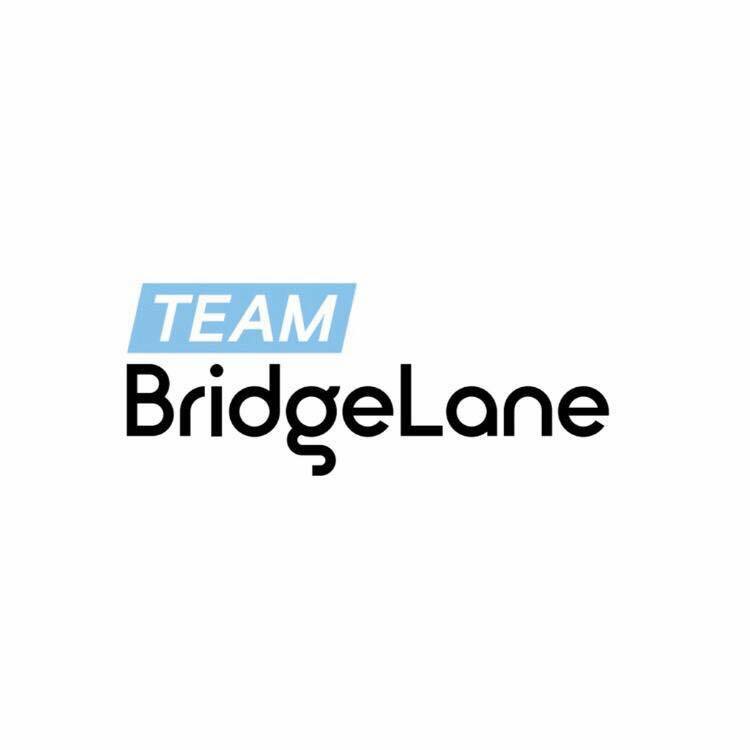 This allowed the club to offer the full range of cycling offering from free training for kids at our crit races, club training rides all the way to a pathway with an elite racing team. The Club announced that its official charity was TAD Freedom Wheels. This charity provides altered bicycles for children with disabilities giving them the opportunity to ride a bicycle and experience the freedom and joy of this hobby that they otherwise may have missed out on. The year also witnessed the commencement of the ‘Battle of the Bridge’ a four round, interclub racing series between MWCC, NSCC, SUVelo and RBCC. Each club hosted a round of racing between these four clubs. Planning is also underway for our next edition of The Wall. Club Champion for Road was Phillip Gray who also took out the Masters Division (40+). 2018 ended with 490 financial members with Cycling Australia.